In this post I turned the FRDM-KL25Z into a USB HID keyboard device. Having the same thing, but as USB HID Mouse device is not much different. Although the FSL USB components had to be updated to make things really easy. Creation of a USB HID Mouse project is the same procedure as for the USB HID Keyboard project here: Make sure you set up the clock to 48 MHz and enable the bus clock for the USB block. You might copy or change the USB HID Keyboard project and change it to a USB HID Mouse project too. A link to my project is posted at the end of this article. App_Task() needs to be called periodically by the application. The method sends the data from the buffer. isEnumerated() return TRUE or FALSE to know if the mouse device has been enumerated on the USB bus. Send() is used to add ‘raw’ data packets to the buffer to be sent. This allows greater flexibility. Move() is using internally Send(), with a simpler interface. With Move() I can send a message that the mouse has moved, with x and y (delta) values. Click() is used to send a mouse click message. It uses a parameter to tell which button(s) are pressed. Init() initializes the module, and is called automatically from the FSL_USB_Stack component. ❗ Depending on how Processor Expert names your components, you might need to use something like HIDM1_ instead of HIDK2_ as in my example. The application is using the reset button on the FRDM-KL25Z board to send mouse messages. As long the board is not connected, it is blinking the red RGB LED. Once connected, it blinks green. Pressing the SW1 button will send one of the messages in the examples. With the Send() method, the first parameter is the state of the button, followed by x and y offsets for moves. which uses an x and a y offset. An example project is available on GitHub here. Make sure you update your Processor Expert components (see here). I have now a simple starting point for using the KL25Z as a USB mouse device. It should be easy to add the accelerometer part to it, so I can have an ‘air mouse’. Let’s see if I’ll find time to add that functionality. Additionally, as the USB HID allows great flexibility, a generic USB HID device would be something I’m interested in. Or a USB composite device with USB HID Keyboard and USB HID mouse. This entry was posted in Boards, CDE, Embedded, Kinetis, KL25Z Freedom Board, Processor Expert, USB and tagged codewarrior project, Embedded Component, KL25Z Freedom Board, open source projects, software, software project, technology by Erich Styger. Bookmark the permalink. Generic HID would be great! I have a problem with USB initialization. 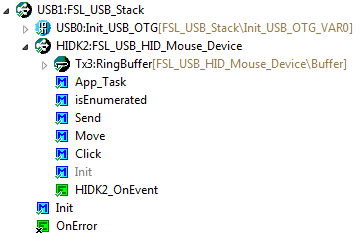 It looks like after USB1_init() ( USB1 is FSL_USB_Stack ) processor is stuck at USB_ISR() ( callback in usb_dci_kinetis.c ). Device is not found by a system ( Win7 ). to check if this helps? Yea, that worked! Thank you very much for your time and happy new year! Happy New Year to you too. Sorry about this problem, I should have it tested more with all my boards. I have commited a fix already on GitHub (sources only, not to the *.PEupd Files). I tested it with the FRDM-KL26Z (this is the only board I have right now with me), and it works. I need to complete some driver work for the FRDM-KL26Z, then I will publish new *.PEupd files. thanks for your work!! this is good, I would like to know how download on github!! Hi Erich, You know whether it is possible implement the USB HID class (neither hid mouse nor hid keyboard) on the kinetis kl25z for sending data to the host ( either VB.NET or another software)! USB HID Keyboard and mouse are already sending data to the host, so you could use that? If it is about implementing a generic HID device: yes, that is possible, but I have not done it myself. I was just playing about this this code, making an air mouse of my own and was trying to add vertical and horizontal scrolling capacity. From what I can decipher from http://msdn.microsoft.com/en-us/library/windows/hardware/Dn613912%28v=vs.85%29.aspx , the data should be sent as byte 4 and 5 of the input report, but unfortunately the USB stack component only allows buffer up to 4. Is there any way I could change to a 5 bit buffer? The coding gives out an error ‘HIDk2_MOUSE_LEFT is undlecared… How can I solve this? Have you generated Processor Expert code? as an additional note: it is K2 (not k2), notice that ‘K’ is in upper case. We also has Processor Expert Problem for “file name duplicate in the project” at the error tab. What should I do? ps: the k2 is typo. Can you send me your project (zipped) to the email address noted on https://mcuoneclipse.com/about/ so I can have a look? I’ve already sent you my project. got it, I try to look at it today. i have a problem running the mouse example. Just startet to work with the freedom board. The EWL files found under C:\Freescale\CW MCU v10.6\MCU\ARM_GCC_Support\ewl, but dont know how to Change the include path in this project, to point to the right folder. the EWL includes are CodeWarrior specific. Remove them from the compiler include path settings (project properties). KDS is using GNU gcc, and it will find its own header files automatically. About USB1.h, etc: they shall be present by Processor Expert code generation in Generated_Code folder. i’m sorry i didn’t answer before. Thank you very much for your answer, now i could get it working in Codewarrior 🙂 In KDS i still have some minor problems, but i’ll get it to work. One of my problems was that i copyed the McuOnEclipse_PEx library to the wrong place. And then goes back to read ADC. But cursor wont move… I hope you can help me… everything else seems good as PCs detect my KL25Z as a FSL HID Mouse. Hello, does it move if you don’t do the ADC sampling? Not sure what your sampling frequency is, but if your microcontroller is busy doing only the sampling and not serving the USB requests, no mouse movement will be sent. I didn’t use it without ADC, besides, I had the ADC in continuous sampling, I changed it to one conversion but it still don´t move… should I do the ADC by interruption? Try to reduce your problem. Turn off everything you don’t need. ADC sampling is not what you need now, so don’t do it. Just do USB communication. Use my working example as base and go from there. Make baby steps and debug them and check if it is working or not. If it is not working, check the difference from the previous working step. I’ve done a new project with nothing but sequential functions that call HIDM1_Move/Click but cursor still don´t move, but my PC still recognizes kl25z as a mouse. (I’m so sorry for being so bad but its the fist time i use usb configuration… and thank you a lot for the support ). Are you using my example as posted with this article: here the mouse shall move. Verify that, and then add your ADC code to it. I believe you are still missing something, so I recommend to use that code/example as a base. I finally did it, my basic problem was that i didn’t undestantd the concept that the functions MOVE and CLICK only filled the buffers that later are send by APP_TASK… so I only was filling buffers without sending them… Besides I can say that it actually can work with 2 channels of ADC in continuous sampling, the only thing that “lags” its when you configure ADC’s in average mode. Ah, that makes sense now. If you just created the events but were not sending them they won’t reach the other side :-). The reason is that as a device you cannot send USB messages: they have to be requested by the host. So all what you can do is to queue messages, and hope that they are retrieved by the host which is handled with the AppTask() routine. In average ADC mode the sampling takes longer for the averaging. Hi! Please help me with a very desperating situation. I`m trying to make an air-mouse but it doesnt appear the option HID MOUSE DEVICE. It only appears the option HID KEYBOARD DEVICE and I cant figure out why. Please, help me! What should I do? make sure you have loaded the latest components from SourceForge (see https://mcuoneclipse.com/2014/10/21/mcuoneclipse-releases-on-sourceforge/). Then you have the HID Mouse device available. Thank you a lot. It works. 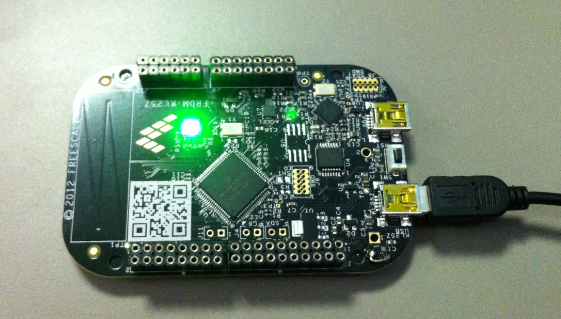 I have one more question: you said in this post that you will try the functionality with accelerometer. Have you tried it? Do you wrote a post about it? I`ve searched and I couldn`t find anything yet. Yes, I did this. But I did not wrote a post or published the project of it. I hope you won`t block me because im already annoying. I want to ask you one more thing: I made a project like yours and when I run the project on my KL25Z, nothing happens and I want to know what I am doing wrong. Do I have to change some settings in my laptop? I mean: do I have to set the board to be seen as a mouse from my laptop? Am I jumping some steps? I mention that I`ve downloaded https://github.com/ErichStyger/mcuoneclipse/tree/master/Examples/CodeWarrior/FRDM-KL25Z/Freedom_USB_HID_Mouse and opened with CodeWarrior and again, when I press run nothing happens. Please give me an advice or something. Thank you for your time. no, you don’t have to setup anything on your laptop to recognize a mouse or keyboard, as the operating system already includes the USB drivers. Make sure you are using the correct USB port on your board, plus check that the device enumerates as USB device. It works now. Thank you for your kindness. and what was the trick/solution/problem? Can you share? It wasn`t a trick. I was confused of how should I use the open SDA port and USB port. First, I had to run the application using SDA port and then I had to switch the cable into the USB port. I was really confused, especially because I`m a very begginer. Now I want to remove the usb cable and make an wireless connection and I`m searching for the best solution. Can you give me an advice or something? Thank you and sorry for the late response, I`ve just seen your answer! can I use this PEx component to make the board act like a MIDI USB device? If so, what should I change to make the computer recognize it as such device and how do I send the data? No, not really. With USB, the device needs to confirm to a certain protocol/class, e.g. USB HID or USB CDC. I have not used MIDI over USB, and I believe there is a USB MIDI class defined. But that class/protocol in not implemented with this component set. You certainly could change/extend the existing code to implement a USB MIDI device, but this will require some USB knowledge on your side. Guess I’ll start reading about it then. I am trying to modify the HID mouse code as mention in the AN4748 (https://cache.freescale.com/files/32bit/doc/app_note/AN4748.pdf) to convert a HID Joystick device, but I don’t be able. Do you have a HID Joystick component? Or You can help me to adapt the HID mouse to HID Joystic as to AN4748 Application Notes.? I don’t have any HID Joystick, that’s why I have not impelemented it. I could try to implement it in a ‘blind’ way, but without having something to test, that might be difficult? You can test direct with Windows Joystick Propierties (In the page 22 of AN4748). It’s posible simulate the movements with KL25 and see in propierties dialiog. Thinks are still experimental, but it shows up as Joystick inside Windows :-). I think it still needs some cleanup of the Keyboard stuff (I inherited it from the Keyboard component) but I hope this is useful for you. As the device class is specified in the FSL USB component, is there any way to use two device classes with the same USB of KL25Z? For instance, HID mouse and HID keyboard devices ? yes, this is possible with USB, this is called a ‘composite’ device: you can combine multiple device classes. OK, I understand. but how can I do it if the FSL_USB_Stack component allow me to choose just one single device class? I had no need for it, so I did not implement it. But you certainly can do it yourself and combine multiple device classes (not sure how familiar you are with USB). You can generate code for one class and then disable the code generation (https://mcuoneclipse.com/2012/03/23/disable-my-code-generation/) and then add the other class. You have to come up with your own USB device descriptor, best if you search the USB specifications (or the internet) for that level of information.